Just over ten years ago, Singh Ab was asked by a friend to assist with launching a mobile kiosk in Scotland. Singh came on board and began running and setting up kiosks all over the UK. Alongside running the kiosks, he also trained and managed staff. It wasn’t long until he finally decided that he could run his own business, so he invested time and money into building his own mobile empire. Oak Mall Shopping Centre has an average footfall of 70,000 per week. Anchor stores include Wilko, Primark, New Look and Topshop. 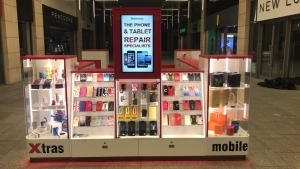 Mobile Xtras launched at Oak Mall Shopping Centre in Greenock in 2015 and since then has been going from strength to strength. Singh aims to become a nation-wide company and he is certainly heading in the right direction. To this point, he has opened kiosks in Castlegate, Cameron Toll, Bouverie Place and four other venues. He is continuously looking for exciting opportunities and currently has tenders in for two additional centres throughout the UK. We have worked closely with Singh, taking him from one centre to five within just one year! Together, we have worked hard to design hi-spec kiosks, source and train staff, invest in training, offer a good working wage as well as creating incentives to encourage and incentivise staff. Whilst working with Singh, it is clear to see that he has real drive and passion for his business. He is committed, and his professionalism makes him a great client to work with. We have no doubt that this won’t be the last we see of Mobil Xtras. We are looking forward to seeing his kiosks in even more shopping centres around the UK. We are also excited to have Singh’s wife, Roopi, join Space to Trade with her new collection of Brow bars – Beauty Boutique. “Working with Lynn Carmichael from Space to Trade has been a huge benefit, she has helped put together proposals for other venues and we are currently looking at locations across the whole of the UK. My goal is to open successful kiosks nationally”. or to request an audit, please get in touch with one of our team..